I first saw her on a beautiful April day in 1992. I was walking along the dock on Seattle&apos;s Lake Union, and there she was. Her stern faced me, and I could not help but notice her fine lines. She was beamy and looked like she knew how to handle herself. She was also beautiful and classy, a real lady. I was instantly hooked and could not resist her come-hither invitation. So I stepped aboard Incredible for the first time. Two months later, I was the proud owner of this 34- foot North Sea diesel trawler, named by the previous owner, Truman Wilcox of Wilcox Farms in Washington State, after the American Egg Board slogan, "The incredible edible egg." I was a bachelor at the time and living in an apartment in Seattle. I purchased Incredible with the idea that I would live aboard and pay off the loan as quickly as I could. With the median sale price of homes in Puget Sound at the time around $135,000, shelling out $65,000 for a boat gave me a moment&apos;s pause as I signed the 15-year contract at First Interstate Bank. However, I felt I could pay off the boat sooner rather than later; I didn&apos;t plan to live aboard long term. I moored the boat in downtown Seattle at the new Elliott Bay Marina, near the Magnolia Bridge. It was Seattle&apos;s showcase marina, complete with a well-stocked chandlery, numerous amenities, and an 11,250-square-foot destination restaurant, the Palisade, which is très chic and dearly expensive and boasts a 1,000-square-foot indoor tide pool. (Needless to say, I was never a paying customer at the restaurant.) Since the marina had just opened, I had my pick of moorage slips. I chose a spot at the end of a very long floating dock where I had an unobstructed view of the Space Needle, the Seattle skyline, and the ferries coming and going. At night, many of my female friends seemed to notice that the twinkling city lights provided a romantic backdrop. But Penny, who later consented to be my wife, quickly put an end to what she called my "babes on waves" program. When Penny and I decided to marry, we had to come up with a plan to merge our two worlds. I lived on a boat in Seattle, and she in a house in Tacoma. It became clear that fitting the everyday pieces of our lives together would be as difficult as solving a Rubik&apos;s Cube. After much discussion, we decided to reshape my portion of the puzzle. I quit my job, moved to Tacoma, and enrolled in the University of Puget Sound&apos;s Master of Education program. And the boat? I soon discovered that being a fulltime graduate student and owning a yacht were, at least in my world, mutually exclusive. I reluctantly decided to sell Incredible and listed her with a broker on Lake Union. But my thoughts were often with the boat and the wonderful times I&apos;d had aboard. My head begin to fill with "what ifs." What if we could figure out a way to keep the boat? What if we could find other couples who shared the same vision of owning a diesel trawler and exploring the waters of Puget Sound, the San Juan Islands, and beyond? I crunched the numbers. If we could find three other couples to share equally in the expense of Incredible, we could afford to keep her. And so the Incredible Club was born. By networking, Penny and I were able to locate three partners in a matter of months. We created a list of couples who we thought might be open to fractional ownership in a boat. We divided the list and started telephoning. Sometimes, a phone call led to a referral to someone not on our list. Face-to-face meetings with interested couples and visits to Incredible followed. In a remarkably short time, three couples signed an agreement giving them fractional ownership of the trawler. The document we all signed in 1994 was based on a co-ownership agreement provided to me by my accountant. As it happened, he owned a sailboat with two other partners and volunteered a copy of the written contract on which his boat partnership was based, an agreement that had been drawn up by one of his attorney boat partners. I revised that contract to meet the needs of the Incredible Club. Over the years, I have revised the agreement several times, based on changing circumstances. Overall, I would say that the boat partnership has worked amazingly well. Partners have come and gone as needs and situations have changed. (There are now three couples in the partnership.) Each couple has brought a unique skill set and area of interest to the Incredible Club that has served the partnership and our vessel well. All have been people of integrity and goodwill for whom I have the greatest respect. I am happy to report that our partnership has lasted 14 years. That&apos;s not to say that fractional yacht ownership is without challenges. A wag once commented to me that he could never share his boat; it would be too much like sharing his wife! Clearly, joining a boat partnership requires an understanding of the benefits and limitations. As Founding Editor Bill Parlatore and others have said many times in PMM when discussing competing design features in boats, it&apos;s all about compromise and what fits your needs. A major plus of shared ownership is counting on others to help pay the costs-no small thing, that, when you consider the costs of moorage, insurance, registration, maintenance, boat loans, and upgrades. For the Incredible Club, these fees amount to $900 per month, split among the three partner couples. Unexpected expenses can be dear, as every boater knows, such as our expenditure of $26,000 to replace the teak decks on Incredible in 2006. More recently, on the spellbound date of Friday, April 13, 2007, a boom crane dropped Incredible on the hard during a haulout. Then, in a coup de grÃ¢s, the crane collapsed on top of the boat, resulting in a total constructive loss settlement from the marina&apos;s insurance company. Eventually, Incredible was sold for salvage for a little over $5,000. I last saw her at a slip on Lake Union in Seattle, covered in a plastic tarp, her humiliation accentuated by the classic lines of a blue-hulled, 42-foot Beneteau Swift Trawler moored beside her. After months of searching, the partnership found and purchased a pristine, fully restored 1968 Grand Banks 32. She was named Mischief, after British mountaineer and explorer Bill Tilman&apos;s boat, a gaff-rigged Bristol pilot cutter on which he sailed Arctic and Antarctic waters for 20 years. I first saw our Mischief on yachtworld.com. She was brokered by Stan Wilkes, owner of Classic Yachts in Des Moines, Washington, a small town on the shore of Puget Sound between Tacoma and Seattle. On the day we encountered Mischief, we were on a mission to visit three 32 GBs in Des Moines, Everett, and Anacortes, a journey of about 150 miles round-trip. Finding the prince requires a lot of frog kissing. At the end of the day, Mischief was the obvious choice. Dennis Johnson, who had conducted the marine survey of Mischief prior to our purchase offer, stated in his report that "the vessel is probably the nicest woodie 32 Grand Banks in the area." On the day we motored Mischief out of Des Moines Marina and down East Passage on our way to our boat&apos;s new home in Tacoma, a passing boat hailed us on the VHF to congratulate us on our purchase and to let us know what an exceptional trawler we had found. Rita, who did most of the brightwork, also decorated the interior with new curtains and upholstery. Benchstyle upholstery, which so often is uncomfortable in the typical trawler saloon, was replaced by segmented upholstery that invites lounging with a good book or special friends. After seeing the vibrant colors on boats in the Caribbean, Rita chose Persian green as Mischief&apos;s accent color both inside and out. It&apos;s a welcome break from the navy blue seen on so many trawlers in Puget Sound, and it sets Mischief apart. 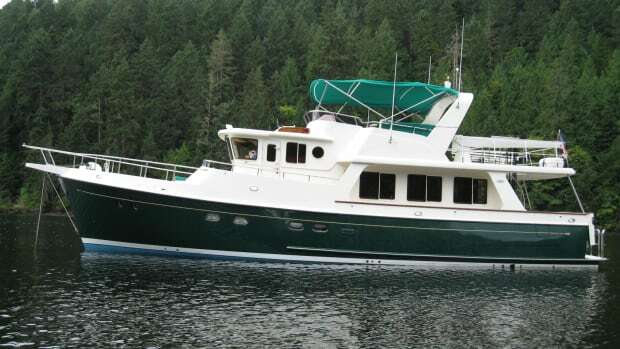 The Incredible Club took delivery of Mischief from Jeff and Rita Schultz in September 2007 for $72,500, inclusive. Rather than take on debt, the partnership elected to contribute additional funds out of pocket to purchase Mischief outright, which kept our monthly contributions to $300 per partner. Since purchasing Mischief, the partnership has added a laptop computer and Rose Point Coastal Explorer marine navigation software. We also plan to add a Webasto 2010 furnace, which will keep us warm during cool Pacific Northwest days and heat our water when we&apos;re on the hook. The cost estimate for the Webasto is approximately $6,000 installed. One of the benefits of partnering a trawler is that fractional ownership equals fractional costs: a huge advantage when facing bills totaling thousands of dollars. Another benefit of shared ownership is shared maintenance. To quote John Heywood, "Many hands make light work." Maintaining a classic trawler in Bristol condition can be a full-time job, so having all hands on deck is a huge advantage. I recall the winter we spent many hours with heat guns and scrapers removing the varnish from yards of brightwork on Incredible. That task would have been absolutely numbing for a single do-ityourselfer. We also pool our varied skills in working through our "to do" list. One partner is skilled in mechanics, another in brightwork, still another in electronics, and so forth. Where possible, we do most jobs on the boat ourselves. Studying Nigel Calder&apos;s Boatowner&apos;s Mechanical and Electrical Manual has been very helpful, as has reading the many technical articles in PMM, especially those by Steve D&apos;Antonio, and taking advantage of the message board on passagemaker.com. Keeping our trawler&apos;s many systems shipshape is a group effort. Many hands and eyes and minds focus constant attention on the same objective: maintaining a reliable, safe, and comfortable cruising vessel in which we all take pride. Each time I leave the boathouse to cruise our beautiful Puget Sound, I do so with confidence, knowing that the work and dedication of a partnership go with me. Joining a boat partnership can also have built-in mentoring advantages for younger boaters who want to learn seamanship, boat handling, and yacht maintenance from more experienced boaters. I must admit that the Incredible Club has never had a new member apply who has not had some boat-handling experience. Before accepting a new member into our partnership, we typically ask for a boating résumé and then check out the prospective member during a sea trial. The eight partners who have been or are now fractional owners in the Incredible Club all have owned boats previously. However, I see no reason why we would not consider a novice boater as a prospective member, assuming that he or she was willing to take boat-handling and boat safety classes and be insurable before soloing. For a young couple with limited funds and limited boating experience, joining a boat partnership can be a sensible way of getting into a family-friendly trawler and a great family recreation. There are also challenges of joint ownership, of course. Sharing a yacht, as mentioned, is a trade-off, as is sole ownership. For instance, partnership means you must always take your partners&apos; needs and wishes into account. Decisions are made together. Majority rules. Before you hang that nautical artifact in the saloon-the one you couldn&apos;t resist buying at the quaint gift shop in Hideaway Harbor-you need to run it by your cruising partners. I recall that we had an extended discussion about covering Incredible&apos;s parquet sole with carpet. In the end, we all walked on carpet, even though I prefer the look of bare wood. Sharing lockers, cupboards, and a lazarette with two or three other cruising couples means that personal items cannot be stored on the boat. Whatever equipment and supplies are on the boat belong to all. If you are a person who has issues with personal space, sharing a boat might wreak havoc with your mental health. Sharing a boat also means you may not be able to take the boat out whenever a beautiful day calls your name. Cruising times are scheduled. The running joke here in the Pacific Northwest is, if it&apos;s raining, it must be my weekend! However, we are all pretty agreeable about exchanging weeks whenever possible. While sharing a boat does present unique challenges that a sole owner may not face, my own experience after nearly 14 years of the Incredible Club boat partnership is that the benefits far outweigh the disadvantages. I have heard that some folks buy a boat together with nothing more than a handshake between them. We believe that a legal arrangement is essential for the Incredible Club. All members sign a formal agreement, the "Incredible LLC Agreement," properly witnessed by a notary public. The four-page document spells out our rights and responsibilities as joint owners of the boat. In addition to the signed agreement, our boat partnership formed a limited liability company, Incredible LLC. The notarized Incredible LLC Agreement serves as our written contract, which is required by law in the state of Washington. The LLC owns the boat, so when a partner sells his or her share, no changes are needed to the boat&apos;s title. The seller is selling a share in the LLC. However, a change in partners does require an update of the written agreement and the insurance policy. 1) A checking account is established in the name of the LLC from which the treasurer pays the bills and into which the members deposit their monthly dues. Each partner has a debit card in the name of the LLC that he or she can use to purchase items for the boat. Approval of all members must be obtained for purchases over $50. 2) Costs of maintenance and improvement of the boat shall be shared equally by the partners, except for direct expenses incurred while operating the boat, such as fuel costs and transient moorage fees. 3) Refueling is done whenever the diesel fuel in the tanks is reduced to 80 gallons total. Whichever partner is operating the boat at this time fills the tanks. Fuel costs are then charged to each partner based on usage since the last refueling, according to the boat&apos;s log. 4) No party shall charter or loan the vessel. 5) Any uninsured loss shall be covered solely by the party incurring the loss. 6) Partners wanting to sell their share in the Incredible Club shall give 30 days&apos; notice, during which time the remaining parties shall be given the right of first refusal. The seller must find a buyer and shall continue making monthly payments to the Incredible LLC account until a purchaser is found. The vessel&apos;s termination value is determined by a formula outlined in the agreement. The Incredible Club meets formally once a year, in the fall. At this annual meeting we set the cruising and maintenance schedule for the coming 12 months. Typically, we schedule two weeks of maintenance during the year, one in the winter and the other in the spring. The cruise schedule gives each couple use of the boat every third week, except in the summer, when each partner has the boat for two weeks in a row. For most of the year, we keep the boat moored in a boathouse in Tacoma, Washington; in the summertime, we move her to Cap Sante Marina in Anacortes, the gateway to the San Juan Islands. Each cruising couple takes turns repositioning the boat from Tacoma to Anacortes and back again, a trip of about 14 hours motoring at 7 knots. One couple will motor the boat up to Anacortes and cruise the islands. Then, two weeks later, another couple will drive to Anacortes, where the boat is exchanged, and the first couple will drive the car back to Tacoma, and so forth. During the year, we stay in touch via email and phone. Most boat business can be handled in this way. If needed, we also can meet where the boat is moored to handle emergent needs, since we live in the same community. We keep a cruising log of our boat use and boat maintenance via an onboard laptop computer, which also runs our navigation software. I am often asked whether the couples in our boat partnership use the boat together and whether we see each other socially. We don&apos;t. The boat is the group&apos;s raison d&apos;Ãªtre. That is not to say that the couples in the Incredible Club are not friends. On the contrary, the members of our boat partnership treat one another with a respect and caring that is built over years of association in a common passion and love of boating. That said, I believe that one of the reasons our partnership has endured for 14 years is because we organize and run the Incredible Club in a businesslike way. It is our desire to share the cost and use of a diesel trawler that brings us together and keeps us together. The members of our boat partnership are dissimilar in age, family status, and careers. We are just ordinary people who share a love of boating. Following are brief biographies of the couples who make up our partnership. Derek and Debbie Keith: The Keiths are in their 30s. Derek works for a global investment company headquartered in Tacoma, where his technology skills are in great demand. Debbie is a schoolteacher but is currently a stay-at-home mom, taking care of her and Derek&apos;s two grade-school-age boys, who take an active part in boating. The Keiths started boating in 1999 with a time-share in a 32-foot Bayliner. They&apos;ve taken the U.S. Power Squadrons boating safety class. Chris and Kristina Wallington: The Wallingtons are in their 40s. Chris works full time for the U.S. Air Force Reserve, piloting huge C-17 cargo planes out of McChord Air Force Base. Kristina is also in the Air Force Reserve, where she works as a nurse. For her full-time civilian job, she serves as a paramedic and firefighter with the Lynnwood Fire Department. The Wallingtons, who do not have children, had limited boating experience prior to joining the partnership. John and Penny Melton: Penny and I are in our 60s. I work for the Washington State Department of Labor and Industries in Tumwater, and Penny is a grade-school principal in the Clover Park School District. We have five grown daughters and six grandchildren. I previously owned an older 18-foot wood cruiser. Penny and I were the sole owners of the 34-foot Incredible before we created the partnership in 1994. Is partnering a trawler for you? If it&apos;s something you&apos;re considering, take the time to research the idea, weigh all of the factors, and decide if it&apos;s right for your circumstances. In addition to what you&apos;ve read here, you&apos;ll find several articles about partnering a boat and fractional boat ownership by searching the web. For us, the Incredible Club has provided a costeffective way to enjoy cruising beautiful Puget Sound and the San Juan Islands in a well-maintained and pristine diesel trawler.